Well, I don’t think this will become a gaming blog… but it is, again today. For the third time in a week, we cleared a table and arrayed shiny, artfully decorated cards upon it, and moved them around in such a fashion that snickers, guffaws, and little shouts of victory ensued. A little bit of beer was consumed, too. Geek Night has returned. I took a little break from it last fall; about a months ago I realized the break was too long, but was committed to a 5-week knitting class. This week, our goal was to just crack open a game or two that we hadn’t yet played: I picked up Recess & Grand Tribunal at the Source Jubilee sale in 2011. Also: we needed to cook some dinner. Board games make it pretty easy to cook and play at the same time, as long as an open flame isn’t happening. Part of the reason we hadn’t yet tried those games was that they required more than two people. That didn’t stop us, this time: I played for myself and for Invisible Moe. We selected Recess, then bailed on the “try a new game” and moved on to a new stand-by, Munchkin (this link is for the review on the TableTop show). While the full page of single-spaced directions was a little daunting at first, we got the hang of it and Recess moved along at a pretty quick clip. I suppose it isn’t too hard to remember real playground rules: stay away from the bullies, use your nuns strategically, run toward the ones you want to smooch. Steve won. He must have had practice, years ago. 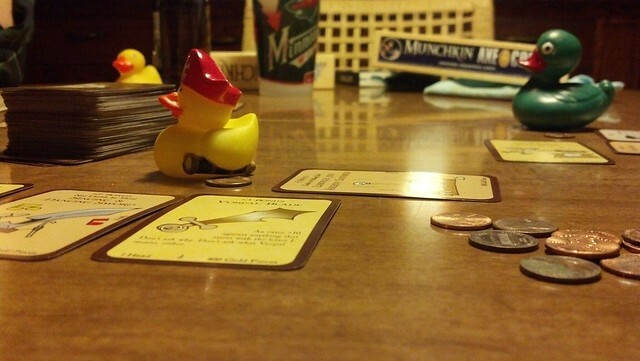 The last time we played Munchkin (here’s the game’s official site) was on our porch on a day like this. Well, it’s still just April and we still have snow on the ground and no desire to play cards wearing mittens. Wistfully we dealt out the first hand for Steve, Moe and myself on the dining room table. Munchkin is a game that looks a little complicated, but all the “rules” are there right in front of you as you play along – they just change pretty frequently. All you need to do is pay attention – and let yourself be entertained by the cute illustrations and well-written options for you to play funny characters with really strange weapons and misfortunes. Takes 30-60 minutes just to read the instructions. We played Fluxx recently and the two games are similar in the constant rule- and fate-changing, but I find Munchkin to be a little more engaging, likely due to the role-playing angle it adds. It’s fun to play a Wizard, Warrior, and/or Elf, even if you lose. And when else can you wield a two-handed (as in, it has two hands, so you can hold one additional weapon)? Such silliness makes this game more sticky. Note: the last time we played Fluxx, we used the Zombie version, which did give it a boost in the engagement area. There are lots of kinds of games out there, many of which appeal to different types of people, and/or to different situations. That said, I’m not sure I see a situation in which I will enjoy a complicated game, especially when it involves manual dexterity. Some of the games on our XBox have so many different button combinations that it’s a proven method of getting me to go read a book, instead. I had the same reaction (a cookbook grabbed my eye) with one of the games Steve and I bought while engaging in some TableTop Day-inspired retail therapy: Android NetRunner. The two of us spent about 20 minutes last Friday night, trying to just get the game set up – we then gave up and reached for Unexploded Cow, instead, as something about its box made its 25-minute game length prediction more credible than the on-box glyphs and instruction novelette of Android NetRunner. Maybe the cartoon style was the giveaway? We’ll give AN another try, maybe on a bright shiny Saturday morning sometime. Perhaps illustration style is the in-industry standard, but I think game boxes need more consistent labeling – and maybe an additional one that gives the user an idea of how much smoke might come out of your head while trying to start the game, given external influences like lack of sleep or alcohol infusion. I’ve posted a few pictures of some of the helpful glyphs that are starting to appear on game packaging. Luck & Skill vs… what? While on a ski trip recently, we introduced Fluxx to a few friends, a few of whom weren’t regular (or even irregular, like me) gamers, and while we did finish the game (that tends to happen soon and always all-of-a-sudden, with Fluxx) fairly quickly, we all agreed that we needed something a little simpler- or at least universally understood. We reached for Bananagrams, and all at the table had a bit more fun. The game is like Scrabble but moves along quickly, lends better to more than just two players, and allows for more creativity. It seems to work better for a group of people who are tired. The only time Bananagrams has failed us was late one evening on another ski trip: we were mega-tired and perhaps a little too wine-soaked, as well. I’d never heard such quiet play of this game! This gaming life is an exercise in observing readiness for rest – not amusement. On Wednesday the meal we managed to prepare and eat while playing was a new recipe for us – the Leek and Bean Cassoulet with Biscuits, from the Veganonomicon cookbook. It was excellent cards-playing grub. Here’s the recipe, if you’d like to try it. Great veggie comfort food! ‹ PreviousSpringy, bouncy. Plus cake.